Dakota State University and its athletic program have recently released a website to detail the newly proposed athletic facility that the University would like to see in Madison in the near future. The website features a virtual tour and an inside look into the master plan that includes new facilities for the University and its athletic teams. The facilities include a new football stadium, a new baseball and softball field, a soccer field with a surrounding track, an indoor training facility for Dakota State athletes, and other extraordinary amenities. The video features virtual flyovers and unique looks at and designs for the newly proposed facilities. All of these new playing surfaces include seating for 500 or more. The website provides detail into what each complex will have, who all is in involved with the project, a mission statement from the Dakota State and its athletic program, what the program needs, and then of course, the proposed concept. It also features interactive maps of where the facilities are located now and where they will be when and if the project reaches completion. There are also pictures depicting the scenes on game days and nights that would turn Madison into the host of what might be the best athletic complex not only in the North Star Athletic Association but in the entire NAIA division. As a former athlete, I wonder, is it worth it? I reached out to current athletes who have reacted to this new proposed facility. These athletes had mixed reactions but all had the same answer to one aspect, and it is that the new facilities don’t affect them at all. “It looks nice, and it will help bring more student athletes to Dakota State, but I won’t be around to use it or benefit for it. It will be cool, but it doesn’t matter to me” one athlete said. The website does not detail how much said project would cost, but by the looks of the video and the images, it doesn’t look cheap. The new facilities would help Dakota State in the efforts to obtain conference championship games and series here in Madison. However, the ability to sign student-athletes and get them to commit here would still be a challenge. The new facilities offer a very intriguing aspect to the recruiting pitch, but prospective student-athletes look for winning and a winning culture, and there aren’t many banners from recent years hanging in the current Dakota State University Fieldhouse. 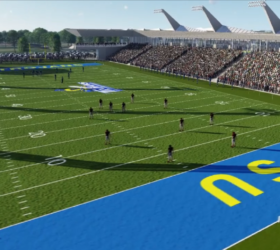 Opinions and thoughts on the new Dakota State Athletics Master Plan aside, when constructed, it will certainly be the most state of the art facility in NAIA.